What’s so special about The Natural Soapworks? The Natural Soapworks makes handmade aromatherapy soaps, bathing and cosmetics products, using carefully selected natural (often organic) ingredients. We're a growing company and still make everything by hand, in small batches, and pride ourselves on our attention to detail and passion for natural aromatherapy skincare. All of our handmade cosmetics are formulated in-house by a clinical aromatherapist, and our products are approved by BUAV's Humane Cosmetics Standard for cruelty free skincare without any form of animal testing. So why do we go to such trouble, when commercial products are so cheap and readily available? The reason is that many commercial products contain harsh or cheap filler ingredients, which dry out or irritate the skin with prolonged use. They’re often designed with mass production in mind, so the ingredients sometimes aren't very beneficial for our skin. 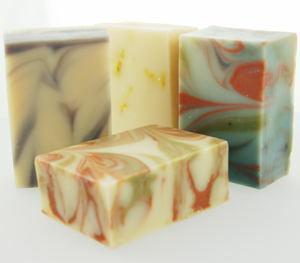 Commercial soaps often contain animal fats - these are rendered down and are called tallow. We always encourage our customers to read the labels of their skincare purchases. Vegetatian and vegan customers need to watch out for and avoid soaps mention sodium tallowate on the label. Some well known soaps also contain SLS, which is a very common detergent which unfortunately has proven links to some skin conditions. We think there is no reason to add detergent to any soap product, since with careful and knowledgeable formulation it will lather beautifully on its own. So The Natural Soapworks was created because we think we’d all be better off if we didn’t put so many synthetic products onto our skin every day. We take great pride in only sourcing the finest natural ingredients, and we're confident that once you’ve tried our luxurious handmade soaps and body care products you’ll agree they’re worth the time, care and attention we put into making each and every batch. Our range includes Natroma aromatherpy facial and bodycare products, so remember to visit our Natroma aromatherapy skincare website Our Natroma range includes creamy hot-cloth facial cleansers (used with a muslin cloth), non-greasy moisturisers, luxury body lotions, oil based facial serums and organic goats milk soaps and bathing products. Large soap manufacturers produce huge batches of soap in what is a highly mechanised process. Typically during the manufacturing process, glycerine (a natural by-product created during saponification which nourishes the skin) is removed and fillers and some synthetic detergents may be added. (The naturally beneficial glycerine is usually sold off as a separate product). Many large companies that produce soap and shampoos buy in the basic soap base and then add their own supplentary ingredients and packaging to the final product. Handcrafted cold-processed soap, on the other hand, requires skillful manufacture to ensure that the naturally occurring glycerine is retained within the soap. It feels very different to the type of soap that's purchased in the supermarket. At The Natural Soapworks we produce luxury handmade aromatherpy soaps, using the traditional cold process saponification method. We carefully blend only the finest botanical oils and butters, to our own unique formulation, to produce a very high quality and natural soap. We haven't cut any corners and insist on only using great ingredients in our special formulation, which has taken years to perfect. We think it's a perfectly balanced soap since it's hard (so it lasts), it has the richest, creamiest, moisturising lather (because we've splurged on the soap making ingredients) and it's bubbly enough to be used as a body wash. The vast majority of our soaps also contain goat's milk - it's a difficult ingredient to incorporate into a soap but it makes our bars very mild and gentle. Our soaps are also beautiful, incorporating swirled patterns and naturally coloured designs so no two bars will ever be the same! We always encourage new visitors to our shop to try washing their hands during their visit, and it's no surprise that they always comment on how their hands immediately feel softer after using our soap. We're very proud that so many people with troubled skin conditions can use our soaps and natural skincare products, safe in the knowledge they will work in harmony with their skin. We carefully manufacture, scent, cure, hand cut, trim and package all of our soaps, and can guarantee that we will only allow natural (often organic) ingredients in our recipes. We use high quality essential oils (we use Aromatherapy Trade Council suppliers) in our cosmetics, which have been skillfully blended to give subtle, delightful natural fragrances with aromatherapy benefits. It's worth pointing out that our soaps are different from those using a "melt and pour" process. This is where a commercially produced soap base is used, which has been designed to be melted down and then poured without changing its consistency. Melt and Pour soaps are created by melting the soap base, adding colours, scents and textures before pouring into moulds and packaging for sale. 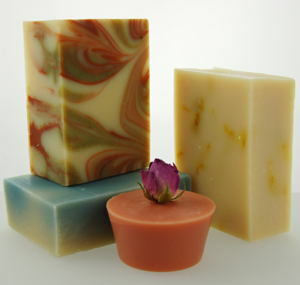 These soaps can be very beautiful, and they usually contain a high percentage of glycerine within the soap base. But they may also contain some synthetic ingredients too - in the soap base itself, or in the synthetic colours or fragrance oils if they are used. These soaps tend to be presented in plastic packaging, since the high glycerine content attracts water from the air and can make the soap softer as it is used. So the good news is that the consumer has a wide choice of soaps to select from. Whichever soap you choose to purchase, we'd suggest that it's always a good idea to try to ask the soapmaker about their soap, and ensure they crafted it themselves. Soapmakers are usually passionate about their soaps, so they'll be able to describe the oils, nutrients, colours and fragrances they have used. To comply with the EU's Cosmetic Regulations, all cosmetic products (including soaps) must be cosmetically safety tested and include a full ingredient listing on the packaging of the product.